Take the bait and get hooked on Fishy! Would anyone like to walk around with a dead fish on his head?! Yes, of course! Lots of people do. As long as it is a knitted one! Thousands of knitters have already knitted the Dead Fish Hat. The original pattern can be found at Knitty. Here you find tips, tricks, ideas and extra's. Fishy loves to help other animals. That's happening thanks to Jane Jenab. She knits items for sale. All proceeds go to Angels Among Us Pet Rescue inc in Georgia. One of the patterns she uses, is the fish hat pattern. Fishy is so proud of that! The pet rescue is a non-profit volunteer-based organization dedicated to rescuing dogs and cats from high-kill shelters in north Georgia. It operates through a network of foster homes in the north metro Atlanta area. Look about the good work these people do on their website. Not every one is able to offer a foster home to an animal. But maybe you want to 'foster' a fish hat. You can buy one through Jane's facebook page. A new translation has been added to the list. 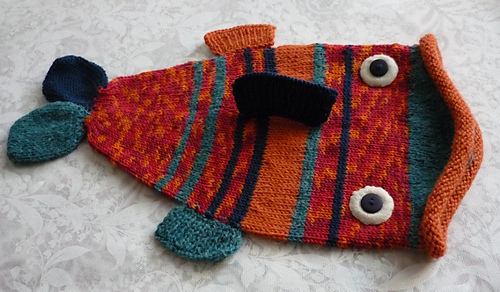 Yana from Israël tranlated the Fishy pattern in Hebrew, after knitting it several times. You can find the translation on her blog. (It will show after the ad has disappeared). Mind you: the translation is for the baby-version Zephyrama made. If you want to make the grown up version, you can use the numbers on the original pattern. This winter, a lot of students at Richmond High in California can be spotted wearing a unique Fish hat. These hats are their rewards for hours of math study – and passing their CST exams proFISHiently. 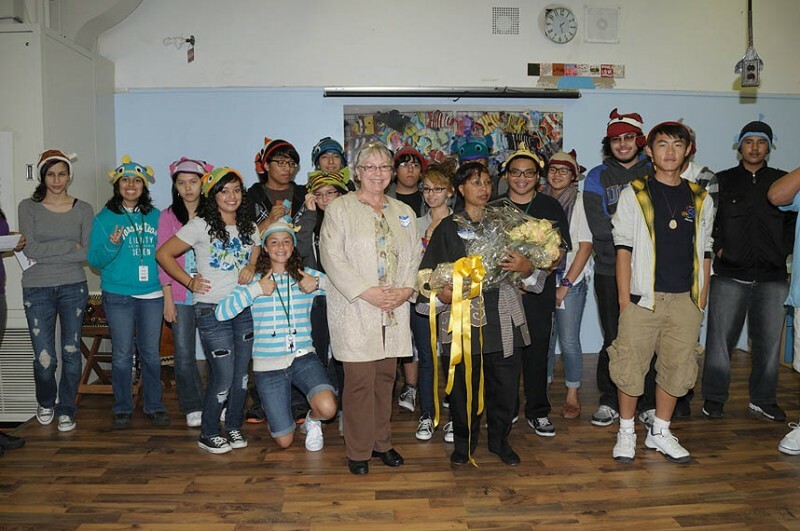 Math teacher (and avid knitter) Lisa Holmes tells about how Fish hats did what tutoring projects and correcting assignments couldn’t: motivating students to take mathematics more seriously. It’s a story about how crafts can bring a community together. Swim here to read the full story of this wonderful achievement. A fish hat for every student who passed the math test! Richmond High Pro-FISH-iency celebaration. Pesce cappello, morto o vivo? If you know any Italian, you'll understand this titel means there's an Italian translation for Fishy now too. It started with an e-mail Thelma got from 3 Italians who wanted to have their own fish hats. One of them was a knitter, but didn't know how to knit from English patterns. On Ravelry Thelma found the Italian Translators group (Traduzioni da Ravelry). Aurelia (a.k.a. Lana-Luna on Ravelry) offered to translate the pattern. Thanks to her, the italian e-mailers can have a go at Fishy now, as can any Italian speaking knitter. You can find the pattern at Aurelia's website (together with other translated patterns) or here at Fishy's own site. The fish hat's translation led to another one. Italian Raveler Trappy offered to translate Small Hills hat. Here's the Italian version of that pattern. The fish hat Aurelia knitted for a little boy, Pietro. There was a crochet version of the fish hat already, but Wendybird wrote down a version of her own. Visit her website and check it out! (It's a free pattern of course). Ab jetzt gibt's hier auch eine Deutsche Tote Fisch ! I'm so happy (sehr Froh!) to announce that my German neighbour-knitters now also have a Fishy pattern in their own language. 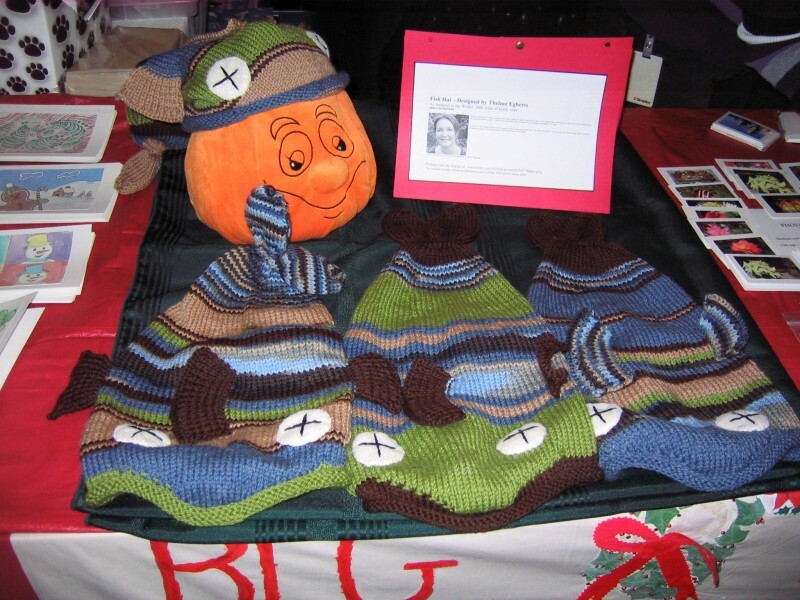 German knitter Diane Roschinsky made the translation. You can find it here in the fish pond, and on Diane's own website. Ist die Uebersetsung irgendwie unklar, bitte frage es Diane. Mein Deutsch reicht dazu nicht aus! The Danes can knit Fishy too! Danish knitters don’t have to understand English knitting terms anymore to knit Fishy. Thanks to Laura, who made a Danish translation. A good thing! You can find it here on Fishy’s own website, and of course on Laura’s blog too. You should really take a look there, because she added some instructive video’s! Laura is just learning to knit – but don’t worry about mistakes in her pattern. A more experienced friend checked it. Christmas time is Charity time. The dead fish hat can be a great fundraiser. Quite regularly knitters ask Thelma permission to sell the Fish’s at charity fairs and usually she agrees. It’s really heart-warming to know that some knitters knit their fingers blue to help others. Kim Stavert from Ottawa, Canada is one of them. This year she made 11 hats and made $ 165 for the food bank. That way she doubled the earnings from the year before, when she made $ 80 with four hats. Both years the hats sold out in half an hour. Here’s the picture from last year. Inspired by the charity knitting of Kim and others? But still looking for a fund to contribute to? Then think about Mukwano Uganda. Mukwano (meaning ‘friendship’) is a Dutch organisation that helps to improve the live of Uganda people, by providing better education and health care. The main project in 2010 was building a school for primary and secondary education in the Bushenyi district. The founder of Mukwano was a young Dutch woman, Joanne Noordink, who fell in love with Uganda after working as a volunteer in an orphanage for six month in 2007. She really wanted to help improving the lives of poor people of Bushenyi region. Back in the Netherlands she started Mukwano Oeganda. Tragically she was murdered shortly after. But her good work goes on. Unfortunately the website www.mukwano.nlis only in Dutch. More info about Joanne in English can be found on the up with people website. Joanne is one of there every-day-hero award winners. Also her former American boyfriend wrote beautifully about her. It isn't clear how people from outside the Netherlands can donate money to support Mukwano Oeganda. Dutch people can send their gift to 1029.61.557 St. Mukwano Oeganda, Aalten. Newest catch: worlds largest fish hat! A lot of special Fish hats were knitted since the pattern apeared on Knitty.com. One of them is extra special. It’s the ginormous Fish Hat the people from Lindstrom (Minnesota, USA), knitted in an attempt to make it into the Guiness Book of World Records. Place of action: Miss Elsie’s Yarnery. Miss Elsies yarnery held a contest to name the big fish. The winning name is Inga, referring to the Swedish settlers that founded the town of Lindstrom. Purl was chosen for the middle name (a real knittery name course). Read more about Inga here. Sensational News Flash... Fishy is connected with a serious murder case. What's to Catch on this site? - Answers to lots of 'fishy' questions, like how to knit the V-shaped tail like in the Knitty pictures. - Fishy pattern for knitting machines! - Check out a photo strip, a comic and a pattern book featuring Fishy!